The Commonwealth Institute building in Holland Park, off Kensington High Street, London, is considered by English Heritage to be the second most important modern building in London after the Festival Hall. It is being refurbished to house the Design Museum, so that the creation in 1962 by architects Johnson-Marshall and partners is saved. In contrast the modernist landscape designed by the renowned Landscape Architect, Sylvia Crowe (one of the founding members of the Landscape Institute) has already completely disappeared. It is shocking that one of only a handful of post war designed landscapes that have been recently added to the English Heritage Register of Parks and Gardens has gone. Modernist landscape design did not take off in Britain and exponents such as Christopher Tunnard would leave England to work in America where his designs were valued.This makes examples such as Sylvia Crowe’s design for the entrance to The Commonwealth Institute so special and rare. She used some of the language found at the Festival of Britain, broad simple plains of surface material, structures appearing to float, elegantly thin railings, water to reflect sky and provide the subtlest of sounds, along with the spectacular array of flags advertising the coming together of the Commonwealth Nations that could be seen from way along Kensington High Street. This was a destination that enchanted children, perhaps with the kind of pull that now draws them to Disney. Along with Battersea Park and its tree walkway this was a ‘must see’ site in London; after exhausting The Tower, Madame Tussauds and Hampton Court.The approach, directly from the high street, was delineated by slight stepped changes in level so that it was clearly part of the Institute site but was open and welcoming, and thrilling to walk across water to reach the entrance. The refurbishment of the building is being overseen by architects Allies and Morrison, who oversaw the refurbishment of the Festival Hall and its outdoor terraces.The new landscape will be designed by Dutch landscape architects West 8. The Garden History Society was not consulted about the removal of the Registered Landscape by local planning authority, Kensington and Chelsea so we must assume that English Heritage failed to flag up just how important this design was. Could it be put back? Technically, yes: by analysing the surviving pictures, plans, etc. it would be possible to ‘re-create’ the Crowe design, but to what end? It has lost its context and the open front, to the High Street has been given over to a new block of flats as part of the refurbishment. Even if put back it would not be with the original materials and we are likely to impose some values from today’s perspective that would mean it would not be Sylvia Crowe’s garden. I feel similarly towards the Frederic Gibberd garden at Harlow NewTown, also now removed from the Register.The developer of this prime site in central Harlow paid to move the garden out of the way. It survives as an embarrassed, truncated remnant, dislocated from its intended carefully designed site. Thankfully, so far, one of the other stars from this period, Geoffrey Jellicoe’s Water Garden at Hemel Hempstead survives intact and is now the subject of a very sensitive refurbishment, part funded by the HLF; however a watchful eye is needed here to protect the setting of the Water Garden from encroachment by proposed new buildings that threaten to leave the garden in a canyon. At the Commonwealth Institute site the refurbished building, Design Museum, new flats and design by West 8 will result in a very vibrant and enjoyable place which I am sure I will visit and admire, but I cannot forgive the loss of a unique and bold piece of twentieth century landscape design and regret the lack of respect and understanding demonstrated by the limp Local Planning Authority and English Heritage. English Heritage have recently consulted the Garden History Society on the likely deletion of Sylvia Crowe’s Commonwealth Institute Garden. from the EH Register of (important) designed landscapes in England and Wales, what a pity they waited until it had already gone! This article was triggered not so much by the destruction of the garden, which had been on the cards at least since EH’s correspondence with the planners at the Royal Borough of Kensington & Chelsea in 2009, but more by EH’s recent letter to the GHS asking for our opinion on the ‘decision to remove it from the Register some years after its destruction. 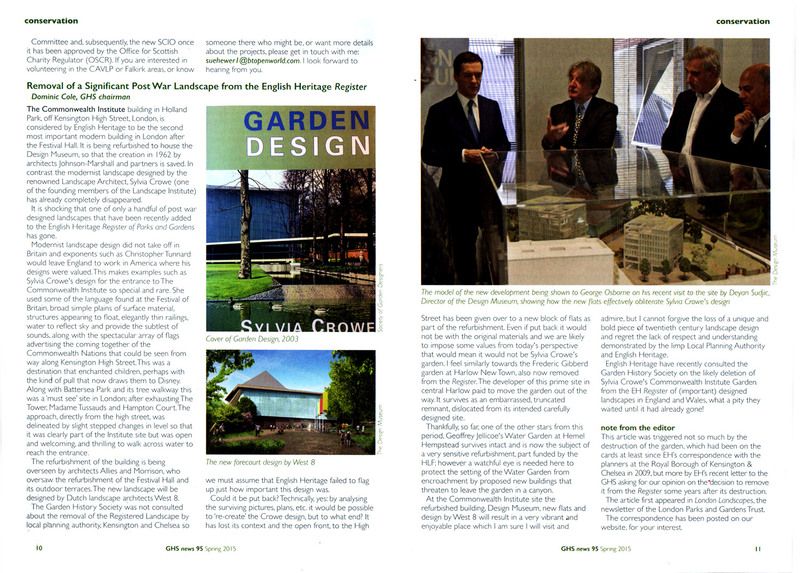 The article first appeared in London Landscapes, the newsletter of the London Parks and Gardens Trust. The correspondence has been posted on our website, for your interest.